The Wild Pack Band: Blues Against Hunger Record Night! Blues Against Hunger Record Night! THANK YOU! THANK YOU! 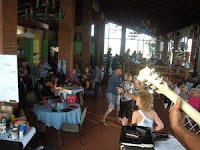 PUNTA BANDA: Rachel and I would like to thank EVERYONE for a very successful BLUES AGAINST HUNGER CONCERT event on Sept 5, 2015 at La Marina Resturant in Punta Banda BC. The food donations were incredible, even 100lb. bag of beans and 100lb. bag of rice. We can't thank you all enough. We are also pleased to say, it was the all time record night for La Marina Restaurant. Thank you to Judy, Ryan, Luis, Lobo, Jorge and all the folks at La Marina for providing the venue and ESPECIALLY A BIG THANK YOU for the $3270 pesos donation to purchase additional food. And for the complimentary drinks to the bands all night. Thank you Patty Rodriguez for helping us with event and taking on the responsibility of getting the food to those in most need within the community. Your help and support is immeasurable. Thank you to Fred Solo for his support, and all the wonderful musicians in the Tsunami band, and ATM band that shared the stage with us and kept the booties shaken all night long. You all made it the party of the summer, and together we will improve the lives of others. Muchas gracias to all!